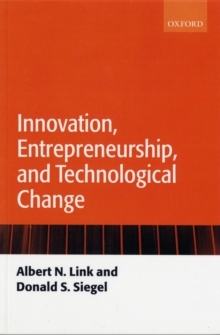 This book presents a reader-friendly analysis and synthesis of the key approaches in economics and management approaches to innovation, entrepreneurship, and technological change. Link and Siegel provide precise definitions of key concepts, present numerous historical examples to illustrate these concepts, outline a framework for analyzing key topics, compare and contrast different theoretical frameworks, provide a reader-friendly interpretation of quantitative andqualitative findings, and emphasize international comparisons of innovation infrastructure and technology policy. Key topics covered include:* basic concepts of innovation and technological change,* a history of the role of the entrepreneur in innovation,* the impact of innovation and information technology on performance, * the analysis of technological spillovers, * innovation in the service sector, * university technology commercialization and entrepreneurship, including property-based institutions such as research parks and incubators, * entrepreneurship in the public sector,* the first systematic analysis and synthesis of the new interdisciplinary literature on technology commercialization and entrepreneurship at universities. While the book reflects the complexities of debate around these topics, it will be an important guide to the area for academics, graduate, and advanced undergraduate students of Business Studies, Economics, Entrepreneurship, and Innovation Studies. The book also provides a roadmap of specific recommendations for managers and policymakers.